As a result to the collaboration of PAL Aerospace and NL EASP AIR the PAL DASH8 Force Multiplier (FMX) visited Schiphol and joined the Static Display. This visit was highly appreciated by the visitors. In 2019 the FMX will be embedded in our MPA Portfolio and available for MarSur and ISR Operations. 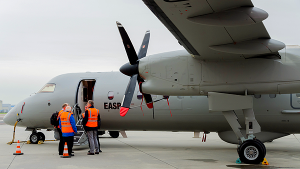 5 December 2018, the 306 Squadron (Royal Netherlands Air Force) and NL EASP AIR signed the first Collaboration Agreement for Internships onboard of the NL EASP AIR Dornier DO328’s that are deployed in Maritime Surveillance and ISR missions. The internships are meant for Sensor Operators of the new MQ-9 Reaper system and offer additional training possibilities in the field of navigation and operation of surveillance sensors and systems. 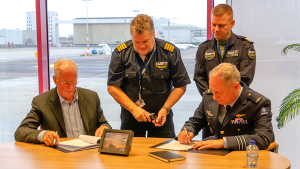 At the same time, JetSupport Netherlands and NL EASP AIR have extended their Teaming Agreement, in which it has been agreed to cooperate on an exclusive basis on future requirements of the NL Coast Guard. At the NL EASP AIR booth in the Holland Pavilion our team, consisting of experts from NL EASP AIR, Spacemetric and Aerodata was available for briefings on our operations and mission tools. We were truly honored with a visit from Dutch Ambassador of the Netherlands in France, H.E. Mr. Pieter de Gooijer. He took the time to get briefed on our C2 Mission Tool I-COP®. This C2 mission tool is used for autonomous operations in remote mission areas. 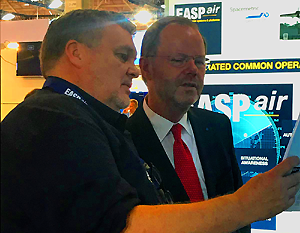 Schiphol, The Netherlands – PAL Aerospace LTD (PAL) and EASP AIR B.V. (NL EASP AIR) today announced their shared intention to collaborate going forward to capture commercial opportunities in both maritime surveillance and intelligence, surveillance and Reconnaissance service provision. The two companies believe this new joint offering will deliver optimized service support solutions to current and future customers while advancing the commercial agendas of both organizations. 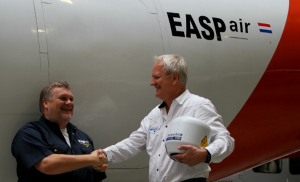 „NL EASP AIR has selected ThurayaAero as the SATCOM platform for special missions operations” – Pieter Voeten, Director of NL EASP AIR announced. The Dutch company and SMP Aviation of Graz, Austria, the exclusive supplier of ThurayaAero, have agreed on the terms of a Teaming Agreement which defines the co-operation of both organizations.